Thai Rice Exporters Association, with current 199 exporter members and 35 two-year term directors, has a very long and proud history. It was founded in 1918 under its original name Siam Rice Association. In the beginning Mr. Ngow Pek Ngam, the owner of “Nguan Seng” rice store, gathered rice wholesalers in Bangkok area and, for the first time, registered the association with the Royal Thai Police Department. The purpose of the association was to be the centre for the local rice merchants. Mr. Ngow Pek Ngam was named the first Chairman of the association. Later on the membership of the association extended to cover Bangkok rice millers along the Chao Phraya River, rice exporters and also local rice merchants. 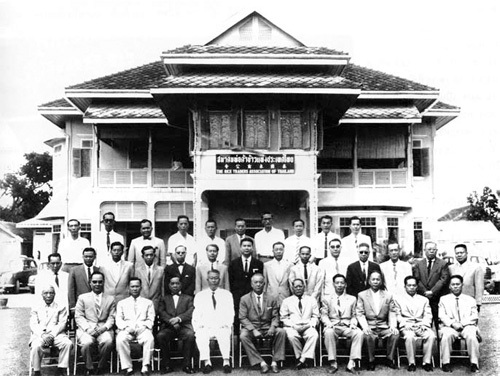 In 1927, the Siam Rice Association changed its name to Rice Traders Association and continued the activities into the Second World War. During that period, the names of the association, the Chairman, the membership activities and the location were changed several times. It is when the activities of its members were largely rice exporting rather than rice milling and trading that the Rice Traders Association changed its name in 1962 to Thailand Rice Traders Association. After the government introduced the Trading Association and the Chamber of Commerce Acts in 1966, the Rice Traders Association registered its association under the said acts at the Office of Trade Registration, Department of Trade Registration. In 1980, the association changed its name again to Rice Exporters Association. By that time its member had increased and the association was strong financially, enough that its members all agreed that it would be appropriate time for the association to own a property. The association then purchased a piece of land and an office building was built on it. The address at 37 Soi Ngamduplee, Rama IV road, Thungmahamek district, Sathorn area, Bangkok is where the association is located today. On April 21, 2008 the association added the word “Thai” to its name to clearly state its nationality so the name became Thai Rice Exporters Association, an association of exporters of Thai rice from Thailand. Throughout its 98-years existence and 26 sets of Chairman and Board of Directors, this old and very well-recognized association has continuously played a very significant part of the Thai rice business. The association is crucial in its role in developing the rice trading industry both domestically and internationally. Together with the government, the association works relentlessly to promote Thai rice to its present day worldwide recognition. It has a role in promoting Thailand as a world famous rice producer and most reliable rice supplier for the world’s population. Since 1964 Thailand has been the top exporter of rice to the world in terms of volume. Thai rice export has continuously brought huge foreign currencies into Thailand and has contributed greatly to the country’s economic development. Apart from working closely and cordially with members and the Ministry of Commerce, the association is obliged to cooperate with The Board of Trade of Thailand and The Thai Chamber of Commerce and with other related associations like The Thai Farmers Association, The Thai Rice Millers Association and The Thai Rice Wholesalers Association. The objectives are to create cooperation and understanding among industrial stakeholders and to dutifully follow the trade policies and other regulations introduced by the government. Many of the Ministry of Commerce’s programs are actively supported or collaborated by the association such as the “Thailand Hom Mali Rice Contest” which is held annually to promote the cultivation and the quality of fragrant rice, and the “Thailand Rice Convention”, a biannual world class rice conference sponsored by Department of Foreign Trade, Ministry of Commerce where Thai rice exporters and buyers all over the globe meet and discuss the industry in the most amicable ambience in Thailand. Thai Rice Exporters Association also carries out another important function of being an important data base for information and statistics on Thai and the world rice industry. Such data are gathered from various sources including from the weekly director meeting. At an international level, the association has expanded its activities to engage in a close and cordial cooperation with The Vietnam Food Association. Rice market data and information are exchanged weekly. The two associations alternately hold their regular meetings twice every year. The Thai Rice Exporters Association strives to achieve its goal as Thai rice export promoter while providing its 208 members (as of March, 2019) with excellent services and information. Our aim as a Thai team is to reinforce Thai rice’s competitiveness in the world market while upholding trade ethics and values in every activity we engage in. Also we lend advice and support to the government and farmers on their rice strategies and action plans to make a stronger and better rice industry for our society. Vision Statement "To maintain the lead in world-class rice export of Thailand"
Being the organization whose active role is to jointly develop policies and trading measures with the government sector significantly for the benefit of the nation. To promote rice exporting business. To strengthen friendship and to exchange knowledge and information among members. To promote cooperation with Thai Rice Mills Association, Thai Farmers Association and Thai Rice Association. To render collaboration and support to the government concerning rice trading policies. To uphold the benefits of rice trading business for members, and to promote fair competition. To collaborate with the Board of Trade of Thailand, trade associations, and government agencies in promoting trade rules and regulations for food and agricultural business, as well as logistics system and other related business.